So, we’ve finally arrived at Part 3. The 9/11 Project, as a kind of review, was “far out there”, idea, and agreed upon by Bill Boylan, (The Boss), and myself. (Not the Boss) This plan and project was funded by you, the readers, and is by far, the most in-depth story we have ever taken on. So, for the opportunity to be able to do this, I thank each, and every one of you. Because, support, is more than just financial. A lot of readers have just been very emotionally supportive, and I value that more than any dollar figure any day. We really do have the best readers out there! As I mentioned in the last part, I had gone to the Remembrance Ceremonies, more or less until 2008. I may have missed one, or two. At that time, the 16 acres that the World Trade Center stood on, was still a 70-foot hole in the ground, with a ramp. In 2008, I remember tens of thousands of people that came to remember the people we lost that day. They came from all over. They may, or may not have known anyone lost, but they still came to pay their respects, because, on September 11th, 2001, we all lost. We all lost our security, our innocence, some did lose friends and family, and some would come to lose friends and family in the wars we had yet to fight. That we are still fighting. But, it is Lower Manhattan after all, and Real Estate Tycoon, Larry Silverstein had just signed a 99-year lease on the World Trade Center Complex in July 2001, for $3.2 Billion. The fires were still burning at Ground Zero when Silverstein called a design meeting for a new building at the site. There was also then a six-year legal battle with the building's insurers. Silverstein had taken out a $3.5 billion insurance policy and his lawyers wanted to double the payout by arguing the attacks were two separate events. In the end, Silverstein was awarded $4.6 billion. 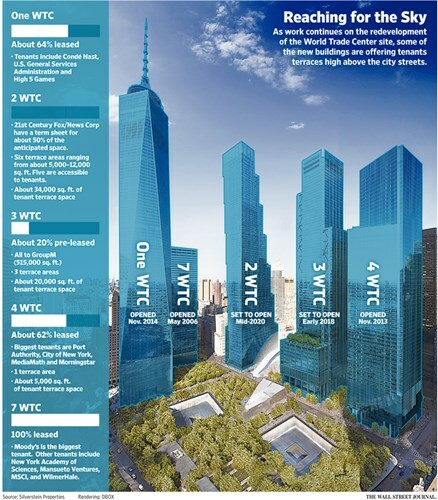 It’s important to note, that the World Trade Center Buildings: One, Three, Four, Six, & Seven, are not part of the 9/11 Memorial & Museum. The buildings are all owned and managed by Silverstein Properties, whereas the Memorial & Museum are owned by the World Trade Center Memorial Foundation and the Port Authority of New York and New Jersey. It’s important to note that the Foundation is a 501(c)(3) non-profit corporation. We didn’t get to visit the 9/11 Museum, because it was closed to everyone else but family on September 11th, which is entirely appropriate. Remember, 1113 people were never identified, and those remains are kept adjacent to the Museum. But, as I think of it more, and more, as I watched a crowd of fewer than 1000 people attend the Remembrance Ceremony, I’m afraid that people will either forget about the importance of the day or just not observe it at all. It’s for those reasons, I believe the 9/11 Memorial should open the Ceremony to the public once again. I also understand security concerns, but we can’t expect people to remember September 11th if we lock them out of the one place on earth where it means the most. If there ever was a proper way to remember the people we lost on that tragic day, the 9/11 Memorial hits the nail on the head. 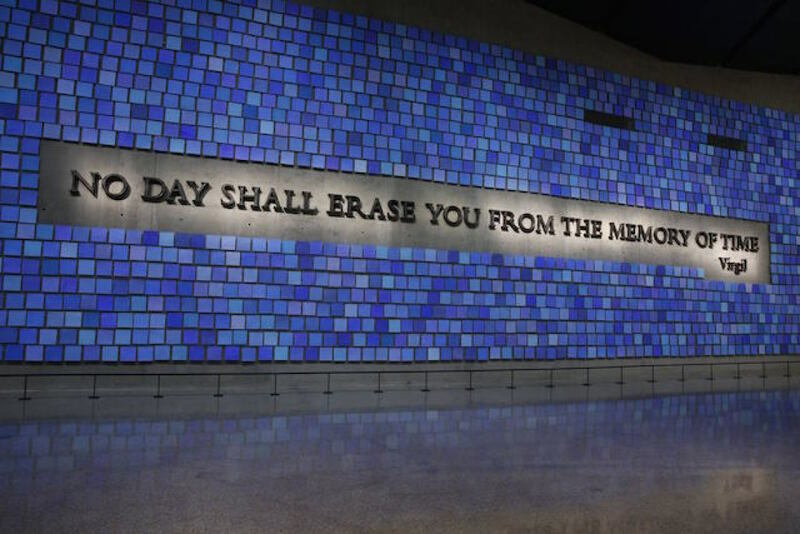 It includes, not only the names of those lost there on September 11th, but also includes those lost in Washington D.C., Shanksville PA, the Passengers of the Flights, and the 1993 Bombing. Architect Michael Arad and landscape architect Peter Walker created the Memorial design selected from a global design competition that included more than 5,200 entries from 63 nations. The Memorial and Museum occupy 8, of the original 16 Acres of the World Trade Center, with the Museum largely occupying underground space. One thing many don’t know is how the names are placed on the Bronze Parapets that surround the reflecting pools of each tower. Of course for the people that died on each flight, all of the names are placed together, as are the names of first responders grouped by company, and the building that they ultimately died. The names of workers of the buildings are not only grouped by building, but each name is placed next to someone each person knew, worked with, or was friends with. Much care was taken when deciding where to place each of the 2,983 names etched into the bronze. The devil is in the details, however, and some critics are upset that the 176-foot square reflecting pools do not match the 211 Foot, 10 Inch actual tower footprints. I think I’ve been as critical as I’m prepared to be, though. After all, it’s not about how high buildings are built, or that they built them in a certain way. Or that the reflecting pools don’t match the exact footprints. One can get lost in being critical. The 9/11 Memorial and Museum did it right. In reality, there was only so much space that a memorial could occupy, and for what they were given, they did an amazing job. The Museum has a reasonable admission charge of $26 for an adult, and less for a child. The 10,000 artifacts they have there will always remain highly important to teach the newer generations coming up about that fateful day, and the Memorial has etched in bronze forever, the names of the people that we lost, but will never be forgotten. It’s important that we see the new World Trade Center buildings and the Memorial & Museum all in the same timeline, though. Terrorists took Boeing 767 Jets and destroyed our landmark buildings with them, and we absolutely must rebuild. It’s not just for our peace of mind to replace buildings for the sake of just replacing them. We have an opportunity to create space that is in demand by commercial developers, where perhaps we couldn’t have done that in the previous buildings. The price per square foot was just lowered to an avg. $69/ Sq. Foot, which in contrast to other buildings in the area, is completely in line price-wise. There are also spaces for freelancers, and independent businessmen starting at $750/ Month, for a furnished office. For the most known address on the East Coast, that’s not too bad. The other side of that coin, however, is that it is the World Trade Center; Security is at an all-time high, all the time, and commuting to/ from work can be hectic. the subway stairs onto Fulton Street and worked our way around to see Building 1, I think what I uttered, was something along the lines of, “That’s it?” It wasn’t impressive. Not the way the original Twin Towers were. 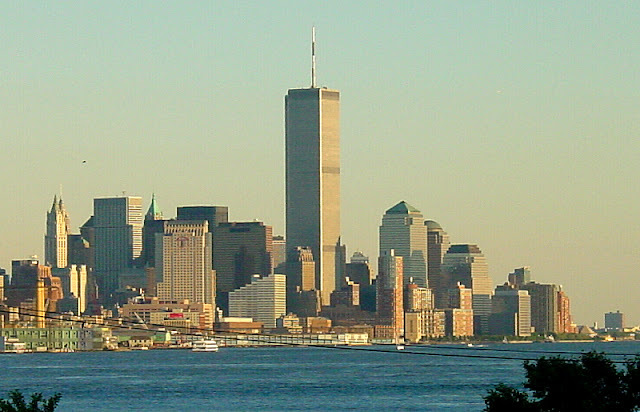 I remember the original Trade Center so well, because I had a break from work the summer before September 11th, and I went there, to the Observation Deck of the South Tower. I paid $15, and a few minutes later, I was on top of the world! From the Plaza below, and from the street, the original Towers looked amazingly tall! The kind of tall where you look up and get nauseous. The new 1 World Trade, just didn’t have that appeal. If anything, it blended in with the surrounding sky. Maybe their goal was camouflage? The other thing I’m not so impressed with, is they turned it into an amusement park. How so, you ask? Simple. For one, to get to the Observatory at 1 World Trade, it’s $68. Amusement Park rates. Then it begins with the elevator ride up; Where video panels all around you take you from bedrock, through the ages, to what is ultimately present day. It opens to a dark cinema. Cinema? Yup, cinema. Where it plays a cool little movie before the big announcement of, “Welcome To the One World Observatory”! And then it opens to, well, the real world. It has a very, “Jurassic Park” feel to it. Maybe people like it, I don’t know. Figure a family of 3 wants to go up, that’s $204! (No, kids aren’t less) It cost $186 for 4 of us on a round trip to New York, on Metro-North, for a comparison. The admission for the Museum goes right back into running things there, and paying off what it cost to actually build the Memorial & Museum. ($700 Million) Security costs for the site average $10 Million per year. To go there, and pay homage to those that lost their lives is a much more noble gesture, and you will learn a ton more! It’s also so close to many other attractions. We saw the hard work of the Port Authority Police, New York City Police, FDNY, FBI, Homeland Security, and Coast Guard when we went. Keeping the public safe is at the forefront of everyone’s mind there. So, if you’re in New York, please go visit the Museum and Memorial. I’d also recommend visiting St. Paul’s Chapel on Broadway, at the Intersection of Vesey St. It played a far bigger role than its given credit for. 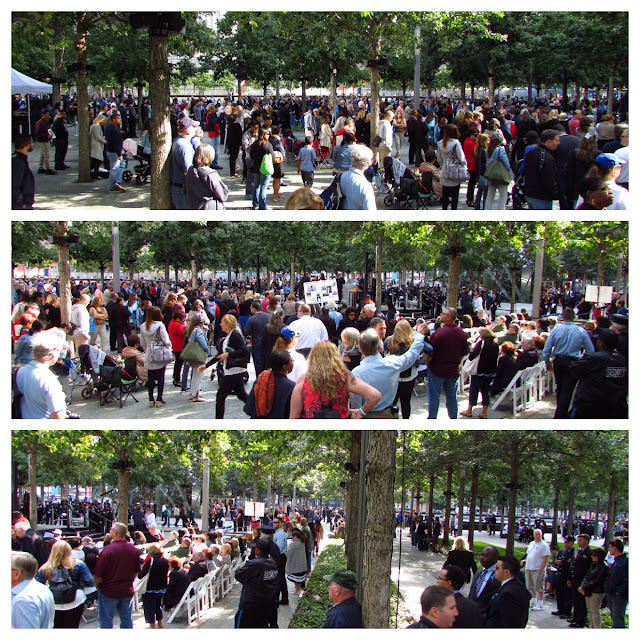 Thank you to all of you that made this possible, and thank you to the 9/11 Memorial & Museum for having us. Hopefully, we will see you next year.